(1) The voltmeter in the shown shown has a resistance of. The internal resistance of the 10 V battery is negligible. 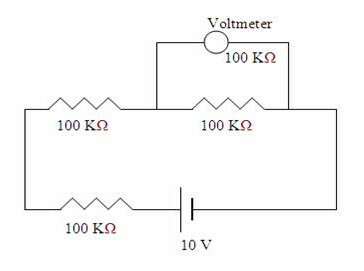 What is the reading of the voltmeter? The voltmeter of resistance 100 KΩ is connected across a 100 KΩ resistor and these two give a parallel combined resistance value of 50 KΩ. The total resistance in series with the battery is 100 KΩ + 100 KΩ + 50 KΩ = 250 KΩ. 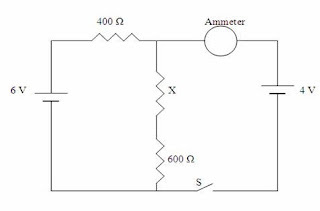 The current in the series circuit is 10 V/250 KΩ and hence the potential difference across the parallel combination of the voltmeter and the 100 KΩ resistor is (10 V/250 KΩ) × 50 KΩ = 2 V [Option (a)]. [We retained the resistances in KΩ itself in the above expressions so that we could obtain the potential difference in volts in a convenient manner]. (2) The adjoining figure shows junctions J1 and J2 of an electric circuit. Currents at these junctions sufficient for arriving at the answer are indicated in the figure. What is the value of the current I? 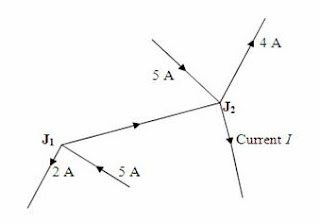 In accordance with Kirchoff’s current law (KCL), the current I1 flowing outwards from junction J1 towards junction J2 is 5 A – 2 A = 3 A. Therefore, I1 = – 3 A, the negative sign showing that the current flows outwards from the junction]. Total current flowing towards junction J2 is 3 A + 5 A = 8 A. Since a current of 4 A is shown as flowing out from junction J2, the remaining current I2 that has to flow out must be 4 A [Option (c)]. [We obtain the charge in micro coulomb since the capacitance is in μF]. capacitor is Q/C1 = 40 μC/2 μF = 20 volt [Option (d)]. [You will be able to work out this problem in no time if you remember that the voltages are distributed among series connected capacitors in inverse proportion to their capacitances]. Suppose you have n wires of the same length L and the same area of cross section A made of materials of resistivities ρ, 2ρ, 3ρ, 4ρ, ……nρ respectively. 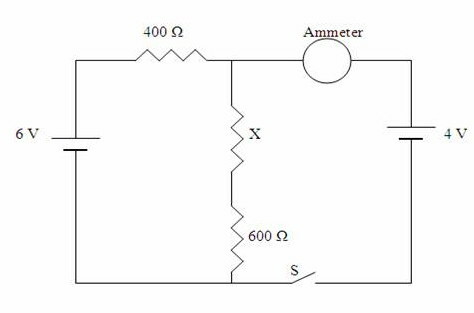 If they are connected in series, what will be the resistivity of the material of the combined wire? The resistances of the 1st, 2nd, 3rd, 4th, ……nth wires are respectively given by R1 = ρL/A, R2 = 2ρL/A, R3 = 3ρL/A, R4 = 4ρL/A, ……. Rn = nρL/A. Or, R = (ρL/A)(1 + 2 + 3 + 4 + ……n), on substituting for R1, R2, R3 etc. Since the current through the ammeter is zero, the voltage drop across the series combination of X and 600 Ω must be 4 V.
[The battery emf of 4 V and the p.d. across the series combination of X and 600 Ω have tu be equal and and in opposition to attain the condition of zero current through the ammeter]. The 6 V battery drives a current through the three resistors and 4 V is dropped across the series combination of X and 600 Ω. The remaining 2 V is dropped across the 400 Ω resistor. (I1 + I2)(X+600) = 4 where I1 and I2 are the currents supplied by the 4 volt and 6 volt batteries respectively.